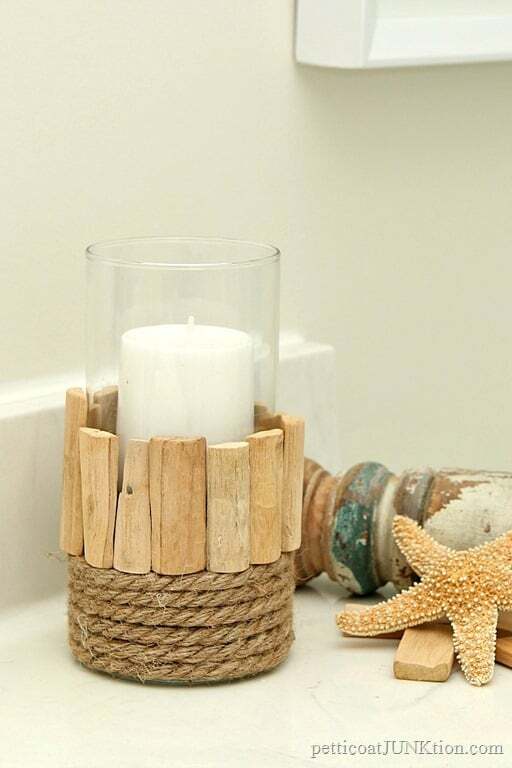 It’s super easy to turn a simple vase into a nautical style candleholder using wood pieces and nautical / sisal rope. 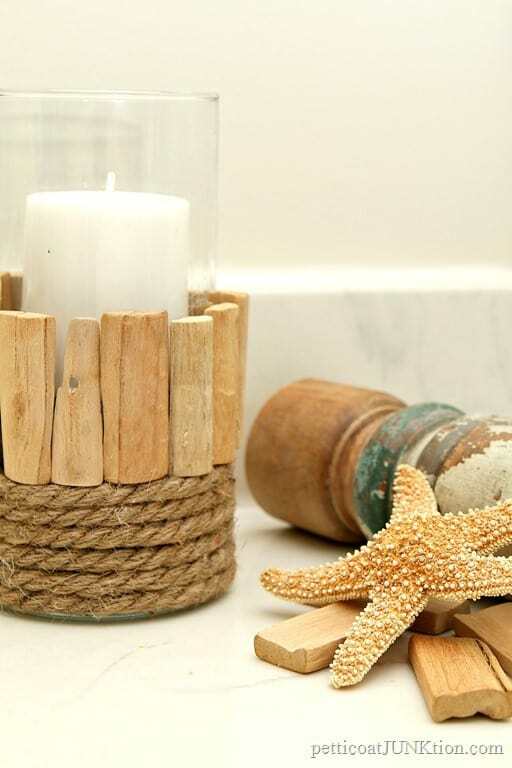 This cold weather has me dreaming of warm breezes and sunny beaches, hence the nautical vibe. I’m excited to join the Dollar Store Design Squad this month featuring crafts made from dollar store supplies. 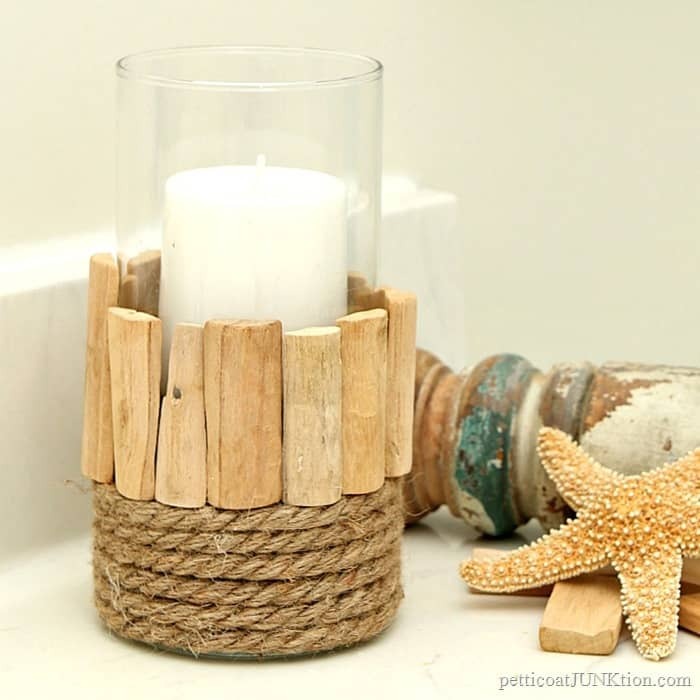 My nautical craft is a three-in-one decorator item . It’s a candleholder or a vase or a seashell holder/display. 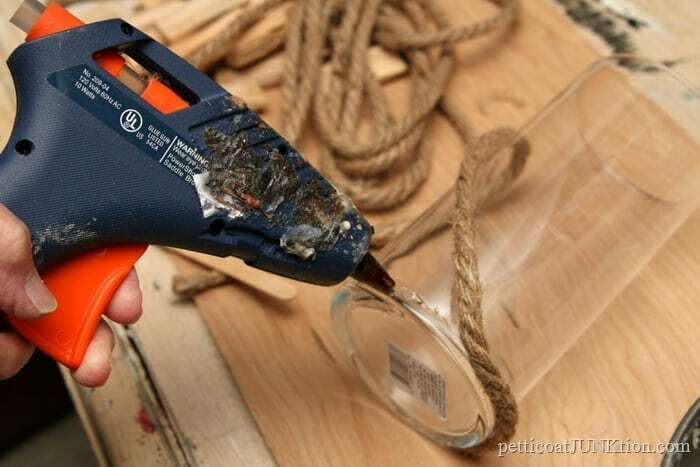 The first step is to hot glue the rope to the glass vase. 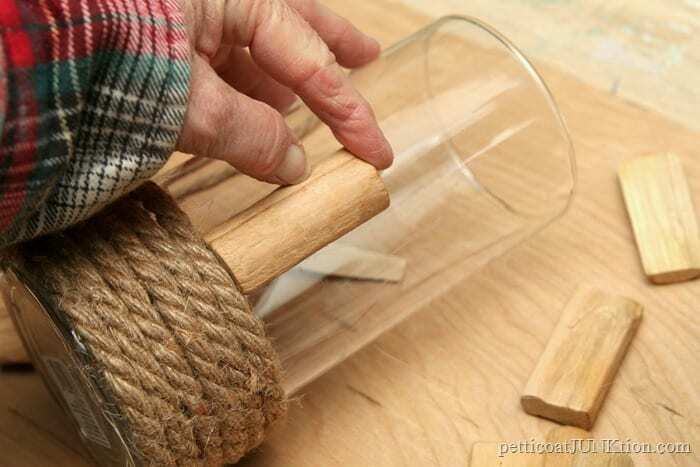 I started at the bottom of the vase and applied the hot glue to the vase then pressed the rope to the glue. I always grab the tweezers or a popsicle stick when using hot glue. I’ve burned my finger prints off too many times with the hot stuff. Anyone feel my pain? I didn’t have a set number of rows for the nautical rope. I just stopped when it looked about the right height. 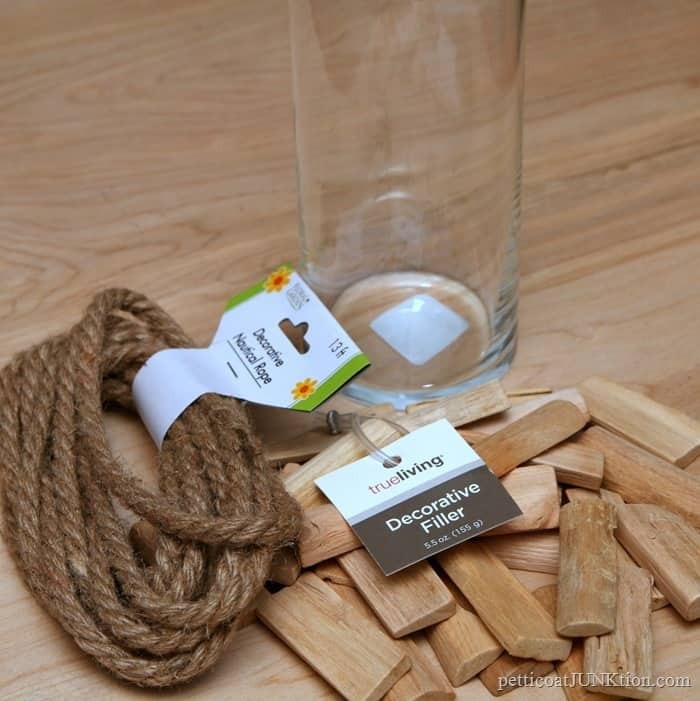 When attaching the wood pieces to the vase I applied the hot glue to the wood not the glass. I was worried the wood pieces might be too flat and stick out from the glass but they didn’t. And that’s all it was to it. Only thing left to do was add the goodies. I almost pulled out a saw and cut the wood pieces varying lengths for a totally different look. But this is an easy craft and I didn’t want to go there. I tried breaking the wood with my hands but no go. I could split them lengthwise with wire cutters but not crosswise. Maybe next project. The cool wood spindle is an auction buy. I have four of them. The starfish has been in my junk stash and I’m not sure where I got it. I think I ordered a bunch on eBay at one time. If you don’t burn candles you can fill the vase with seashells. I have boxes and boxes of shells picked up from trips to Kodiak Island and numerous beaches along the Florida Panhandle. If you don’t have a seashell hoard you can buy those at the dollar stores too. Or we can use the vase as a planter. 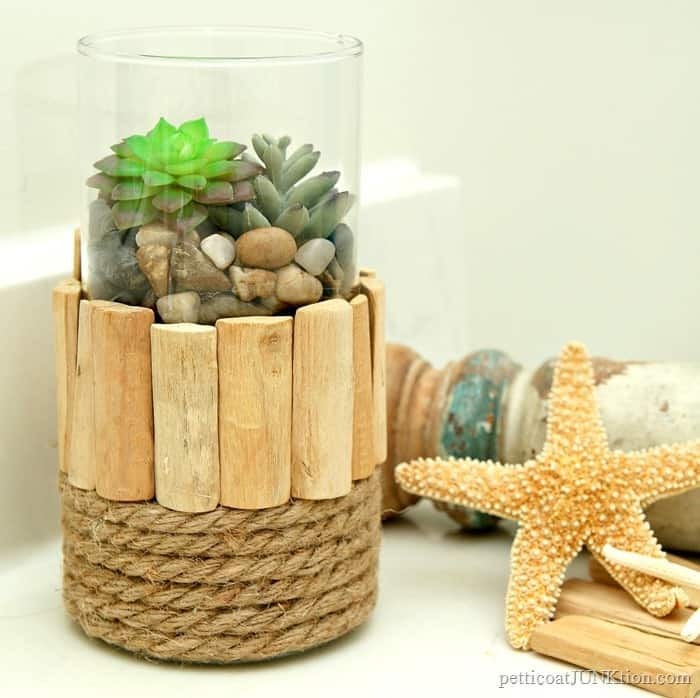 The river rock and faux succulents work with the nautical vibe. I have to say the Dollar Tree is one of my favorite shopping places. I go in to pick up a couple of things and come out with a bag full of stuff. The candleholder cost $4 to make including the candle. Not bad, not bad at all. I also have leftover rope and wood pieces to add to my craft stash. 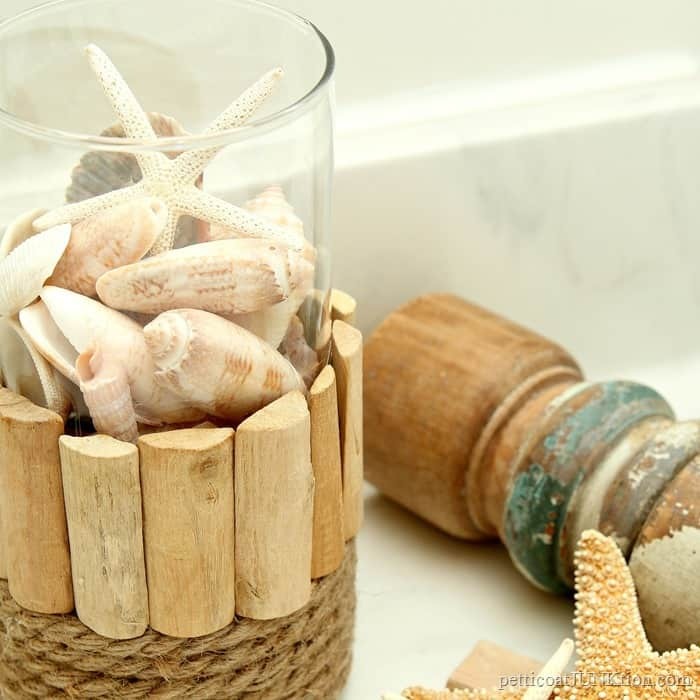 How do you guys like the nautical candleholder/vase/seashell display? Leave me a note and take the Design Squad tour by clicking the pink text links below the photo. 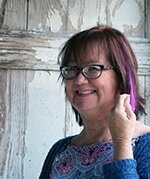 I’m off to take the tour…..
« How Do I Remove Duck Tape From Furniture? Help! Love it! I have drift wood on hand..I have to give it a try! Kathy, what a beautiful vase you created, and so easy anyone can do it with your instructions! I love it both with the shells and with the succulents. Dollar Tree is a favorite supply source of mine too. I love it! I love all the alternatives for using it, too! 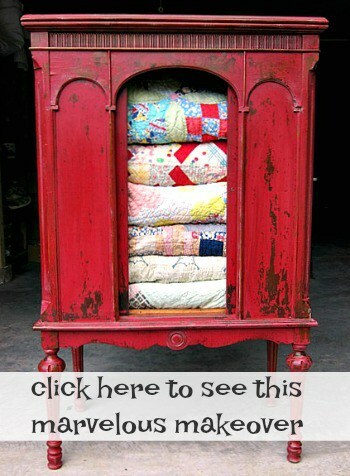 Great project and so inexpensive–I like inexpensive! Kathy Owen – I love your nautical style candleholder!!! I visit the Dollar Tree and Dollar General all the time scoping out bargains. So glad to see that we can make this one for under $5! Thanks for sharing your creativity! These are fabulous. I love what you did here, and the icing is, the material came from the $ store. Turned out great. 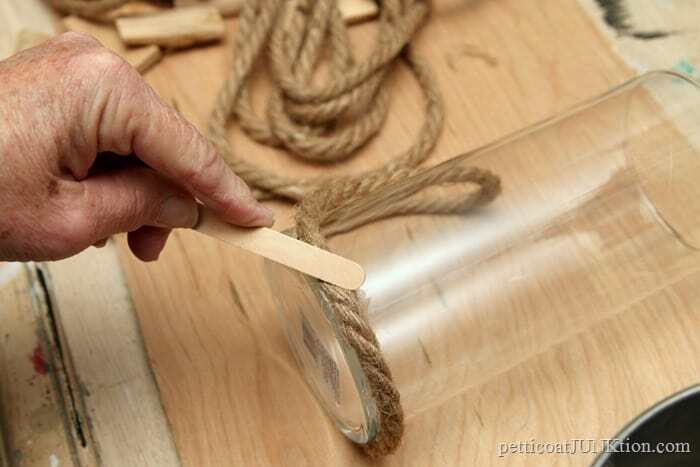 That is so smart to use a craft stick to press down the rope. 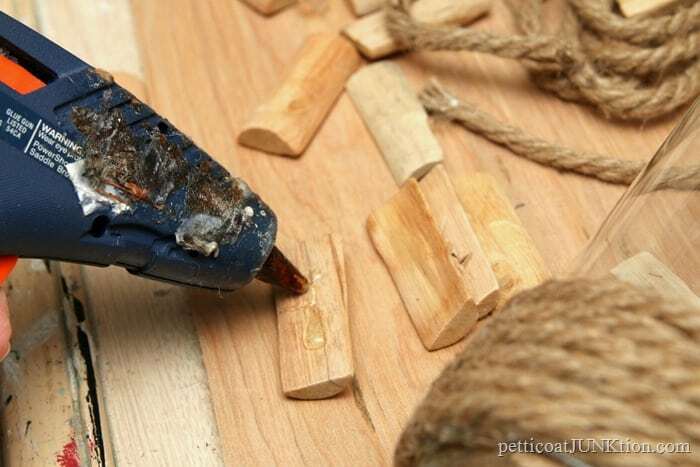 I always burn my fingers on that dang glue. lol. This is the best beachy decor! I’d love to make a set of these for our back table by the water. Pinned! I love the candle holder with the succulents so much. So adorable. Kathy, you are amazing! This is just beautiful. I’m going to make this absolutely. Thanks for all your wonderful ideas. That is so summery. I have a lot of shells, so think I’ll try that one first, maybe do the candle one for outdoors @ BBQ time. Ooh, I really love it with the succulents! You are so creative! I love that you got everything at the Dollar Store. There are so many possibilities with this project. Can’t wait to try it.